With this huge move the last couple months I find it interesting to see the same theme occurs in countless media articles and market forecasters in that routinely begin discussing indicators like the VIX or number of up days in a row or unsustainable chart patterns or low volume rally, ecetera…….you get the idea. It can be easy to get caught up in the the media articles, opinions from professional investors on TV, investor forums, but this can cause one of the biggest mistakes that I have made and most other investors and traders will make at some point in their investing career. It is so tempting to want to make big bets like buying puts or shorting stocks at the “top” or buying calls or long stock at the “bottom”, but you will soon realize that the market can remain irrational a lot longer than your account can handle it. One of the biggest things I have learned watching the market over the years is that while there are some good indicators to indicate a coming change in trend, the market can take a lot longer to reverse that trend and defy all indicators. This can be emotionally and financially devastating learning this lesson and the best advice that you need to learn as a trader is TO LET THE MARKET TELL YOU A TREND HAS CHANGED rather than predicting that the market trend will change. What I mean is that if the market is overbought and ripe for a sell off like it is now(S&P 500 chart on the left) then it is best to wait until the market has sell off (ideally with higher volume and with a weak bounce) than to keep trying to make bets that the market has topped. For example, if you look at the chart at the left you will see that back in Sept/October 2010 people were saying the market had run too long with low volume and the economy was not great, and chart indicators said market was overbought. 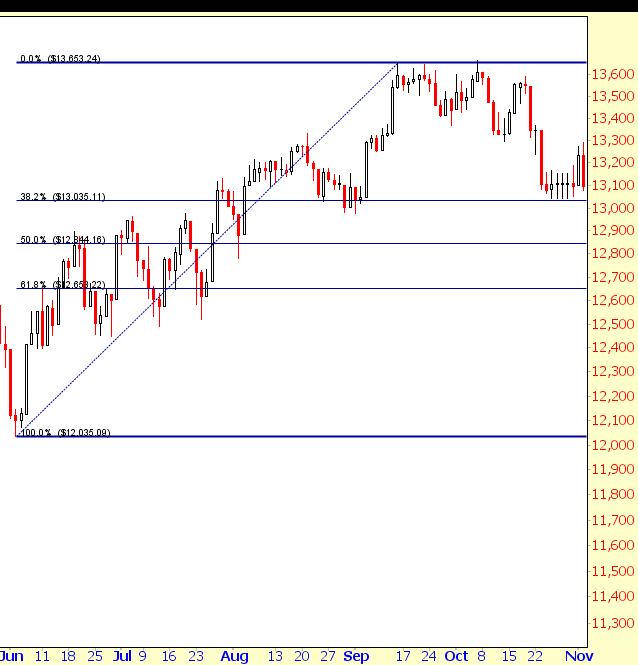 So many media outlets had people saying market will pull back when it hit resistance at 1219. It made a very small pullback and everyone said the market was done. Unfortunately for short sellers the market ran straight up with no pullbacks for 3 more months on low volume despite all the predictions and chart indicators,etc…. 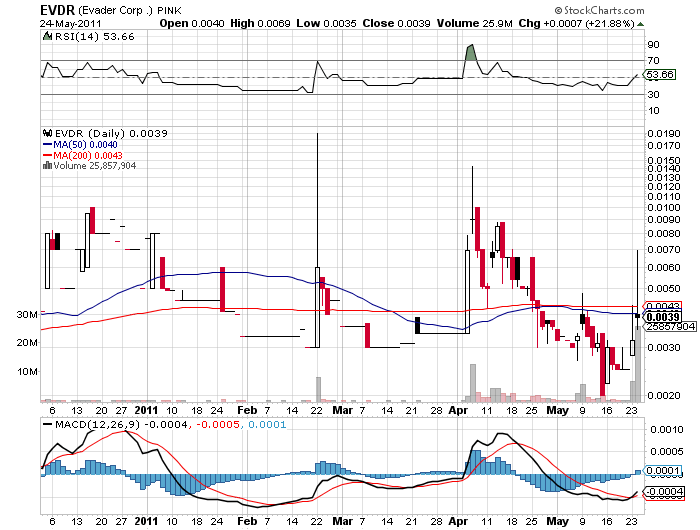 Now look at the chart today(the right side of the chart on the left) and you can see that it is now at the same predicament of having made a run for the last couple months on low volume without a pullback, and is now at big resistance. 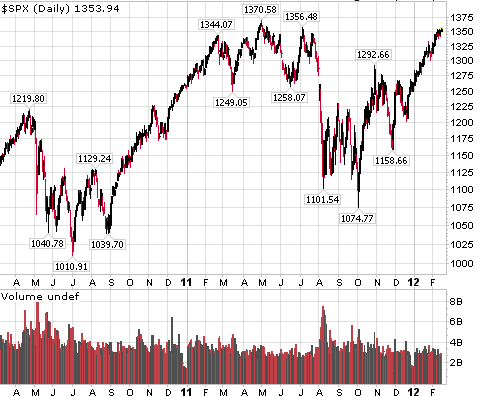 Now that you have seen what happened in fall 2010 would you make the same big bet right now that the market has topped ? The other popular indicator I have seen everyone referencing when the market has made a big move is they reference the VIX charts. The VIX is a volatility index that measures the time value of a basket of options tracking the S&P 500 (read this for more info on VIX ). You will hear pundits and media saying that the vix is low so the market has topped because the VIX reflects fear and a low VIX reading means low fear. The popular theory is that a low VIX(low fear) reading after a market has made a run means people are complacement and therefore the market will roll over. 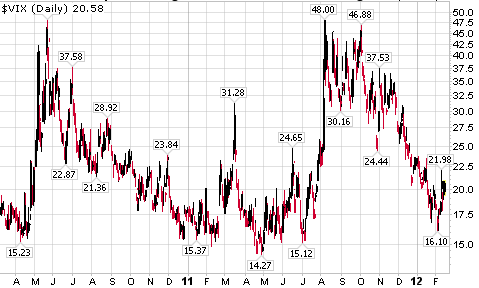 Again, reference the chart of the VIX on the left. 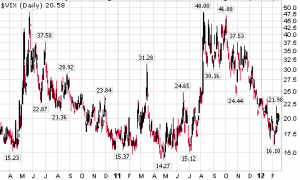 See what happened to the VIX in November 2010. It was at the same levels it is now after the S&P 500 had made a huge run. If you notice that the VIX continued to move lower as the S&P500 moved another 120points higher(10%). That would be pretty painful if you continued averaging down on shorts or kept buying puts thinking you were right about the market having topped. What I hope you have learned from the above commentary and popular charts is that is that if you plan on trading the market then you need to learn to PAY ATTENTION TO THE CHARTS AND NOT LISTEN TO OPINIONS. WAIT FOR THE MARKET TO TELL YOU A CHANGE IN TREND IS COMING. I personally think the market is near a top and has massive resistance to get through here but it very well could just consolidate here with little pullback and then break higher. I have learned to just wait until the market puts in a big volume down day to tell me that the market is tired and trend change is coming then try to predict. I Lost Money in a Ponzi Scheme ?